SSC MTS Exam 2018 Delayed: Staff Selection Commission (SSC) is expected to release the notification for Multi Tasking Staffs is for SSC MTS Exam 2018 on 3rd November. But the SSC MTS Exam 2018 notification delayed. Yet now there is no any update to release the notification from the SSC recruitment board. 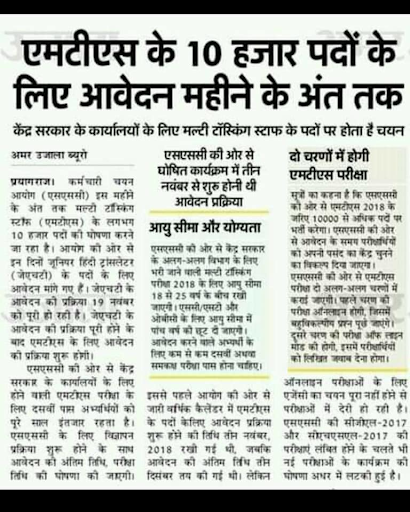 Now we are expecting that the release date of SSC MTS Exam 2018 notification will be on December month. This is not the first time to get a delay. Continuously it’s happening every year. According to the exam calendar off SSC, the notification should release on 3rd November and it will get closed on 3rd December. But The SSC MTS notification not yet released. In the previous year, SSC recruitment board was released 8,300 vacancies throughout India. This year the expecting vacancies will be 10,000+. Lot aspirants are eagerly waiting. SSC MTS Exam is conducted every year to select the staffs for multi-tasking. The posts which come under MTS are Mali, Safaiwala, Junior Gestetner Operator, Jamadar, peon, Chowkidar, Daftary. Candidates should possess Matriculation exam or equivalent from the recognized board. The age limit will be 18 – 27 years. These are the eligibility criteria to apply for SSC MTS exam 2018. The exam will be conducting on two phases Paper I & Paper II. Phase I will be an Online CBT exam and Phase II will be on Offline. Paper-I consists of Quantitative Aptitude, Reasoning Ability, English knowledge, General Intelligence, and General Knowledge. Paper II consists of Descriptive like Essays, Letter writing etc. Candidates should clear both the phases to crack the exam. SSC Recruitment 2018 has released the notification for the recruitment of Stenographer and Junior Hindi Translator. Online applications are inviting from the eligible candidates to apply for the posts notified by the SSC recruitment 2018. SSC has opened the marvelous career forum. A lot of aspirants are looking for a bright career. Candidates those who are having a passion to work in a central government sector can utilize this opportunity and get into the most reputed organization. Eligible and interested candidates can apply through online from 22-10-2018 to 19-11-2018. Age limit for this is should not exceeding 30 years. Exam date for Steno will be from 01-02-2019 to 06-02-2019. The selection process for Stenographer will be on 3 stage Online CBT, Skill test and Final selection. Exam date for JHT will be on 12-01-2019. The selection process for JHT will be on 3 phases Online CBT, Translation Test, and final selection.